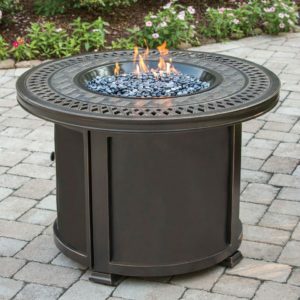 Click on any of the images below to see a larger picture and product details. Colonial Tables & Chairs: Offered in 3 heights; Chat, Dining, and Pub. 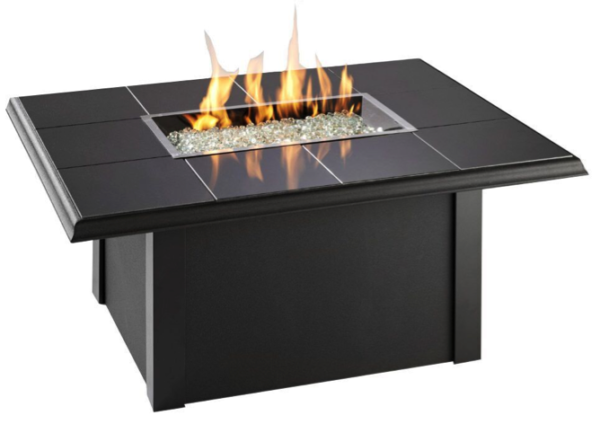 A Supercast Marbleized Noche Top, colonial fiberglass base with burner cover and 20” Crystal fire burner with glass fire gems. Includes hose, regulator, gas valve, metal flex hose, natural gas orifice, electronic piezo. 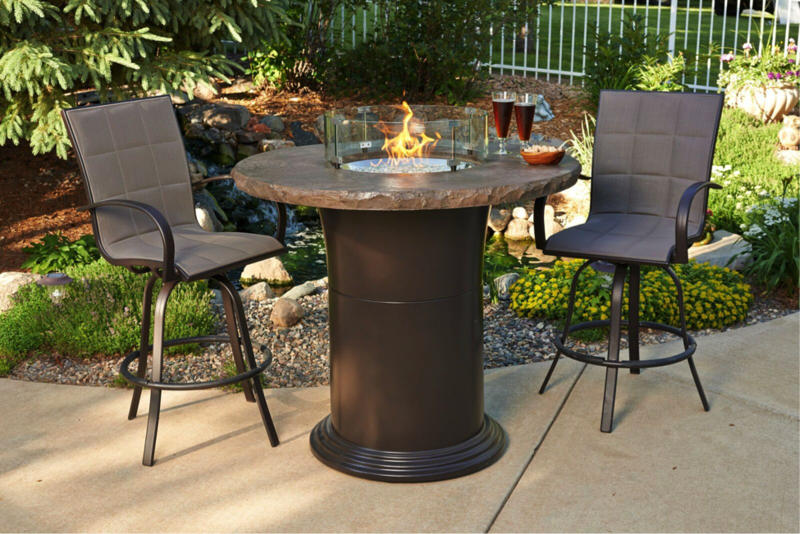 Chairs are Rust Proof powder coated aluminum frame in Dora Brown Finish, Outdoor-rated fabric padded sling in Taupe Swivel base. Inquire for more available options. 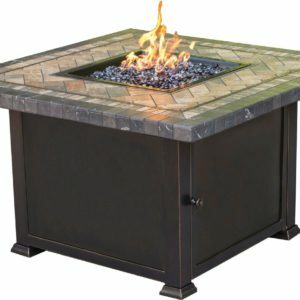 Naples Fire Pit Table: Outdoor-rated resin balsam color wicker, tempered glass top, rust free aluminum frame, access door conceals standard 20lb LP tank, black glass cover for Crystal Fire burner, glass diamond fire gems, orifices for LP/NG, electric piezo, 20” stainless steel burner, 60,000 BTU. Inquire for more available options. 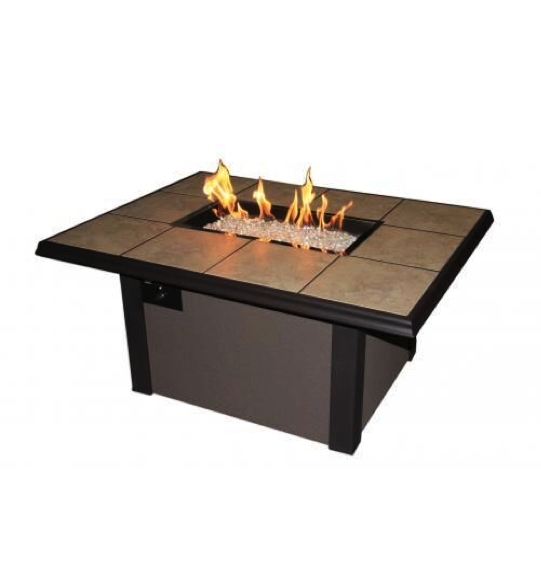 Sierra Fire Tables: Recessed cover for burner, orifices for LP/NG, hose, regulator, gas valve, metal flex hose, electronic piezo, access door conceals 20lb LP tank, durable supercast top, outdoor rated faux stone. Available in square or rectangle. Inquire for more available options. 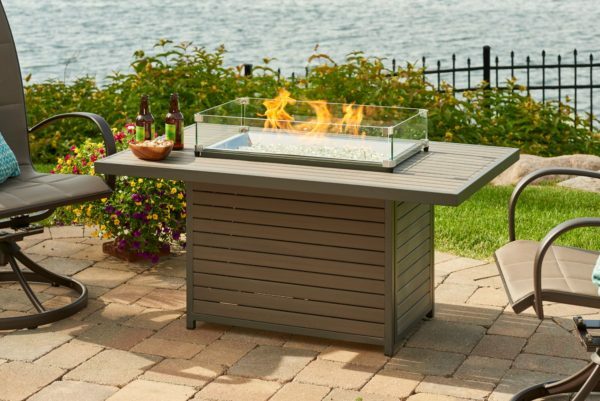 Napa Valley Fire Tables: 12” x 24” Rectangular crystal fire SS burner w/ glass diamond gems, orifices for LP/NG, hose, regulator, gas valve, metal flex hose, electronic piezo, 55,000 BTU, conceals 20lb LP tank in base, tiles are removable. 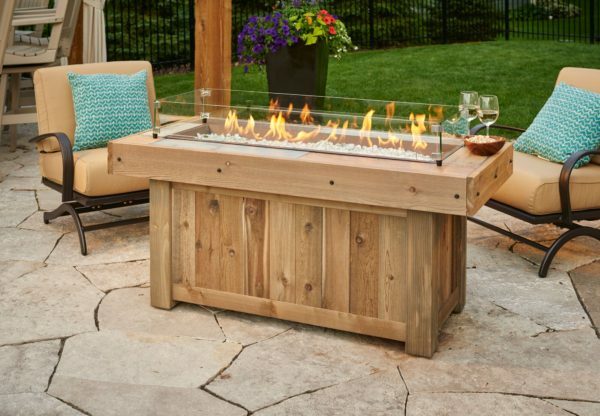 Montego Fire Coffee Table: Includes 12” x 42” Crystal Fire SS Burner w/ Glass Fire Gems, LP orifice with hose and regulator, gas valve, metal flex hose, electronic piezo, 60,000 BTU, natural gas orifices included, standard 20lb LP tank conceals in base, glass burner cover, available in black or balsam wicker base. 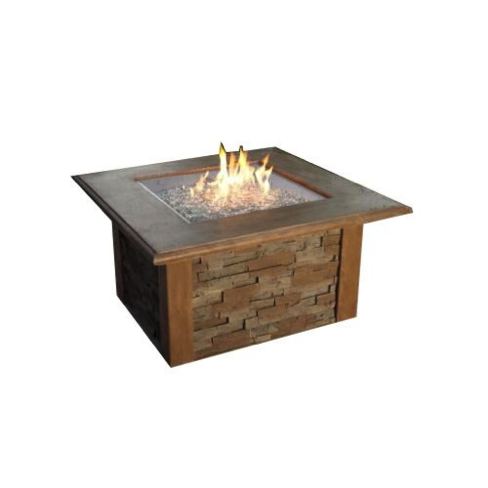 Key Largo Fire Pit: 12” x 42” Rectangular Crystal Fire SS Burner w/ Diamond Glass Fire Gems, orifices for LP/NG, hose regulator, gas valve, metal flex hose, electronic piezo, 20lb LP tank conceals in base, 60,000 BTU, available in Stainless Steel top & Grey Toreneo Base or Midnight Mist Supercast Top & Grey Toreneo Base. Inquire for more available options. 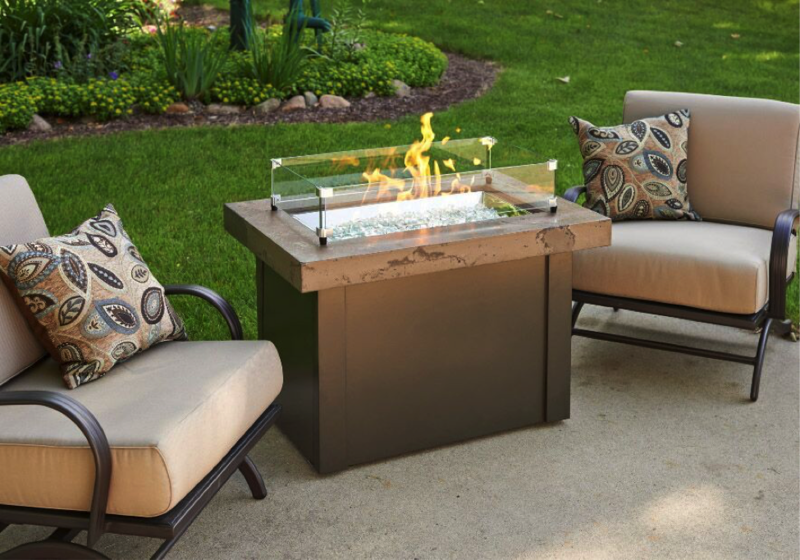 Providence Fire Pit Table: 12” x 24” rectangular Crystal Fire Stainless Steel Burner w/ Glass Diamond Fire Gems, orifices for LP/NG, hose, regulator, gas valve, metal flex hose, electronic piezo, standard 20lb LP tank conceals in base, 55,000 BTU. 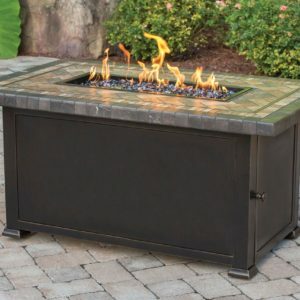 Available in Stainless Steel top, White Onyx Top, Silver Vein Finished, Copper Vein Finished, or Marbleized Noche Top (pictured). 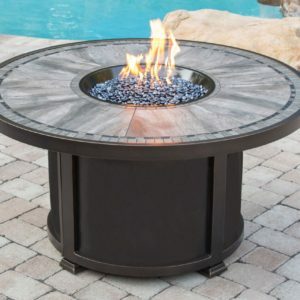 Brooks Fire Pit Table: Fire pit features easy to maintain Taupe Composite Decking Top and Base, Grey Graphite Powder Coated Aluminum Framing, and CF-1224 Stainless Steel Burner with Diamond Crystal Fire Gems. 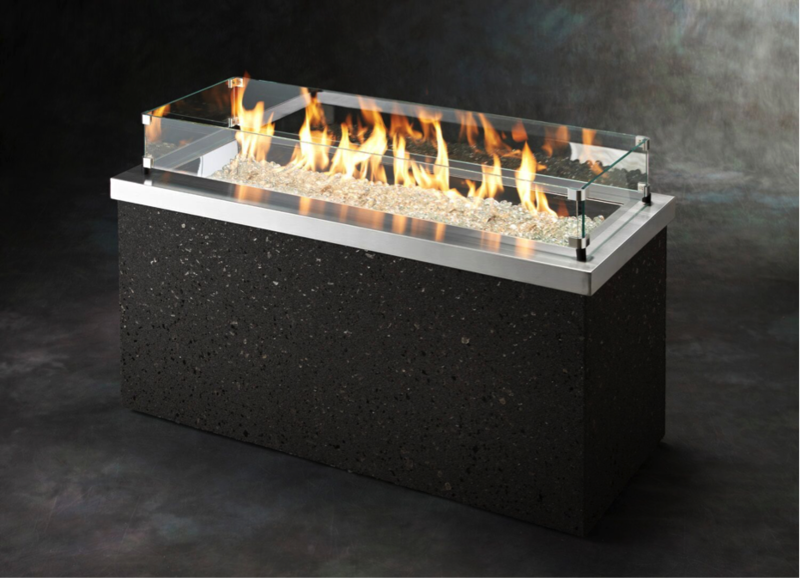 Optional Glass Burner Cover. 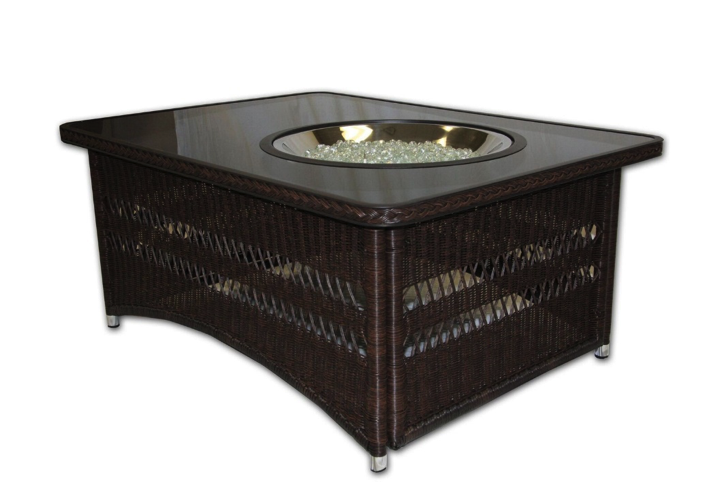 Standard 20 lb LP Tank conceals in base (tank not included). 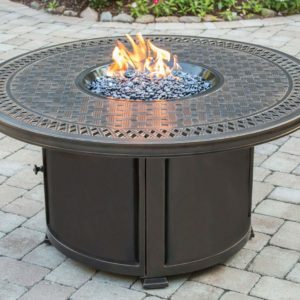 Vintage Fire Pit Table: Fire pit features colorful Faux-Wood Tile Top, Distressed Wood Slatted Base (unique to each fire pit – grain pattern will vary), and CF-2424/CF-1242 Honey Glow Brown color coated Stainless Steel Burner and includes Diamond Crystal Fire Gems. 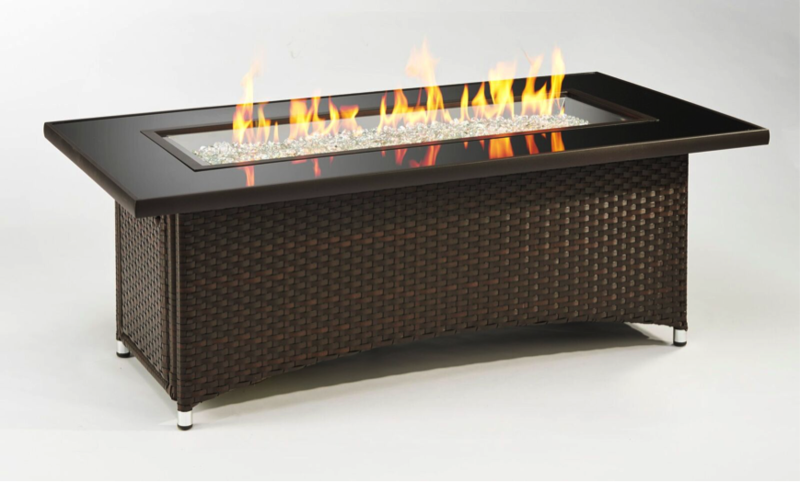 Optional Glass Burner Cover. Standard 20 lb. 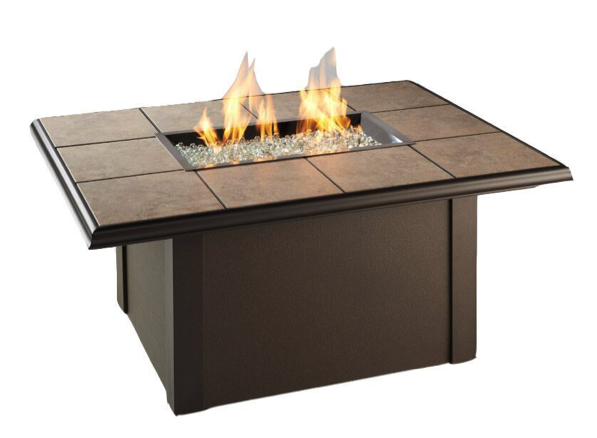 LP tank conceals in base (tank not included). 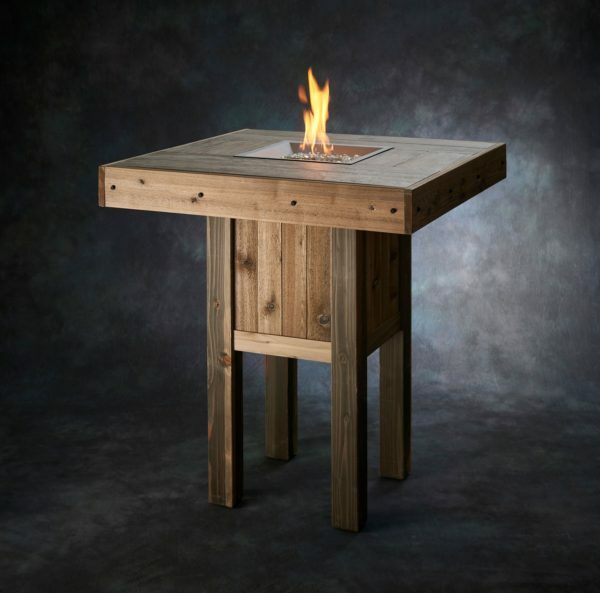 Westport Fire Pit Tables: Fire pit features colorful Faux-Wood Tile Top, Distressed Wood Slatted Base (unique to each fire pit – grain pattern will vary), and CF-1616 Pewter Finish Stainless Steel Burner. WP-1616 includes Diamond Crystal Fire Gems. 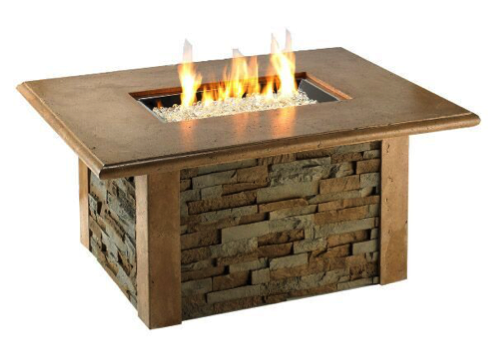 WP-INT includes Intrigue Fire Feature and Tumbled Lava Rock. Standard 20 lb. 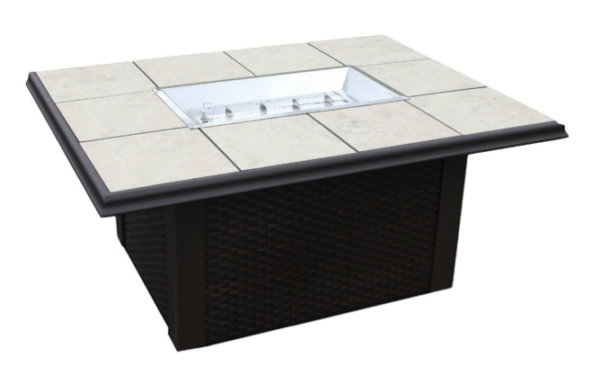 LP tank conceals in base (tank not included).